If you are an author looking for ideas for blog posts (or if you’ve run out of blog post ideas), you have come to the right place. Don’t feel bad: Sometimes, coming up with new ideas for blog posts is difficult even for the best writers. Below, you’ll find a great list of blog post ideas for writers that you can use as writing prompts. These ideas are specific for novelists, poets, and writers of short stories and personal essays—and they will have you blogging in no time. Take it from us here at Web Design Relief—literary agents, editors, readers, and fans will love your author blog when you begin incorporating these blog posts ideas! Where did you go on your last vacation? Share meaningful moments and pictures on your blog. Mentor matter: Write a blog post about a person who has been important to your writing career. And if you’ve had more than one mentor, write more than one blog post! Book reviews: Write thoughtful reviews of novels, memoirs, poems, or stories you’ve read. Just remember: Other authors are reading what you write! So while it’s always right to be honest, you may want to take care. HINT: You can make this a weekly series on your author blog. Things that inspire you: Post pictures of images that make you feel inspired, and explain why they matter to you. A blog post does not have to be very long! A day in the life: What does your normal day as a writer look like? Readers are curious about how writers work. How do you keep your ideas organized? Do you use an outline? Note cards? Spreadsheets? Talk about how you manage all the information for a given writing project. Talk about the first piece you wrote. If possible, share it on your blog! When did you know you wanted to become a writer? Talk about the moment you thought writing was something to do seriously. What advice do you have for aspiring authors? Share the lessons you have learned. Talk about your plans for the future and how you hope to get there. Do you have a specific plan? Or are you going where the wind takes you? Your DIYs: Share your crafts and other projects with readers. When possible, include a tutorial so others can be inspired by your creativity to make their own projects like yours. Your favorite writing advice: What have other writers said that inspired you to keep going? Pass their meaningful words along in a blog post. What is your mission as a writer? What do you hope readers will take away from your work when they read it? Create a post about your philosophies and hopes. Writer under construction: When you take a writing class, read a book about writing, or attend a writing conference, post your reflections and responses. When possible, include pictures from your real life. Follow industry events: These days, the publishing industry is in a state of flux. There’s a lot to talk about. Follow the news and share your own opinion. It matters! Follow cultural and newsworthy events: Share your reactions to the important moments that we have in common. Host a giveaway or contest: If you have a new book coming out, consider giving a copy away to one writer who answers a question or leaves a comment on your blog. You can also do this with bookmarks, journals, pens, letter openers, or any writing related gadgets and accessories. Did you do anything this weekend? Get in the habit of taking pictures wherever you are. You’ll find there are lots of opportunities to talk about where you’re going and what you’re up to. Family connection: Major family events and holidays are often great fodder for insightful discussion on a writer’s blog. Just be sure you have your family’s permission and include pictures, when applicable. Three ways you would change the world: If you could make three tweaks to the way things are now, what would they be? Staying inspired: What do you do to keep your creative muse healthy? Do you listen to music? Visit art galleries? Share your techniques for keeping your creative muscles in top shape. What’s on tonight? Write about your favorite television show from the perspective of a writer. Talk about why the writing of the show that you like is so great. Let’s go to the movies: Sometimes writing a blog post about a movie that “everyone’s seeing” can be a great way to get people talking. Again, put on your writer hat and talk about why you think the script works. Writer fashion: What’s your favorite writer style? Dressing to the nines? Or PJs all day? Love letter to a product: Have you found an awesome new product that has revolutionized your life? Talk about why you love it and spread the word! Bonus if it has anything to do with books. Support your favorite cause: Use your author blog to talk about something that truly matters to you—and give readers the opportunity to do something about it by sharing links on your author blog. Who are your top five heroes? Who are you top five heroines? Who are your top five antagonists? What are you researching? Talk about the most interesting points of your research for your latest project. This is a great way to introduce readers to a forthcoming work. Talk about your setting: Is it a real place? Why did you set your book there? Does it have any personal meaning? Talk about your characters: Is there any particular character styled after a real person? Do the characters have personal meaning for you in some way? Talk about the moment when the idea for your story first came to you: Was it a eureka moment? Or was it gradual? Talk about your journey to publication: How did you get your book published? Talk about the research you had to do for your book: Did you enjoy the research? What did you like about it? Talk about other books or novels that inspired yours. QUESTION: We know there are a million more blog post ideas for authors. 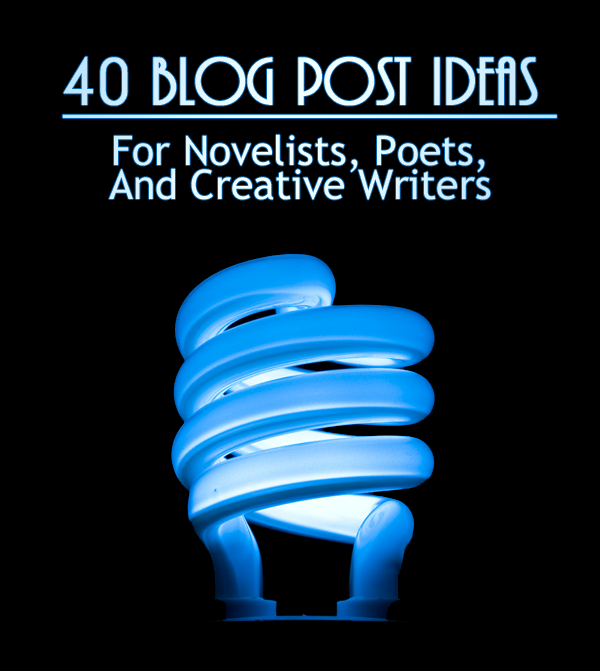 Do you have a great blog post idea for authors? Post your idea in our comments section below! Great ideas for blog posts, especially number 2. Love this post. It does get hard to come up with fresh ideas all the time, so this list is awesome. Thanks! I blog at least twice a week on It’s Not All Gumdrops & Unicorns. Most of my blogs are Song Saturday and Cartoon Sunday entries. I regularly post a block of songs by a soloist or bands. While I’m in the process of doing that, I conduct my own research. Then, I will add my personal views and experiences, that somehow connect with the soloist or bands. I do the same thing for Cartoon Sunday blogs. The only difference between Song Saturday and Cartoon Sunday is that I post either animated shorts, or a complete episode of a cartoon or Anime. I’m constantly thinking about new ideas throughout the week. I love the idea of blogging about specific aspects of an upcoming book. My upcoming book is set at a fictional college that is based on the college I attended, so I want to blog about specific places on campus, professors or classmates who inspired certain characters, and campus ghost stories that appear in one form or another in my novel. Another blog I’d like to do someday is a reflection on novel writing as a form of therapy, allowing me to work through some of the junk from my growing-up years. I am a recently self-published author and started a blog a month ago. This gives me some great ideas, as I try to blog once or twice a week and just needed some help. I especially like #24, because I listen to music all the time for inspiration. The neatest thing I’ve done is letting readers name and background a character. I’ve done this in each of the four books in my series and it’s been amazing. In my latest one, I also described a bar in my book and asked for a name. I would not have thought of The Tattooed Pelican by myself. Great post! I am definitely bookmarking this for later. Thanks, Victoria! Keep reading our articles for more great blogging tips. Great post. I am an author and publisher though I have yet to jump out into the publishing aspect. Right now I’m trying to build a bigger fan base and obtain more exposure. Blogging is something I need to improve on. This post has definitely helped with ideas. The comments as well! Thanks again! Hi, Kendra! Thanks so much for your comment. We’ve got tons of other helpful articles you can check out to boost your blogging and social media as well! Great post ideas! I may be using some of these in the future. I’m a new author. The suggestions and ideas listed above are great advice. I’ll be putting some of them to good use. Thank you. Blogging is something I feel obligated to do, so I often struggle with creative ideas. Thanks so much for this list, which I will be referencing in the coming months! Great list. Very helpful and inspiring. Thank you. I’m leaving with some new ideas. I am a new author with my debut novel “Reckless Beginnings” due out at the end of the year. Great ideas I will definitely use some of them in the future 😀 Thanks!